I love the new Lancer Evolution MR four-door sedan from Mitsubishi. It has all of the racecar thrills that you would expect from a track-ready, street-legal performance machine, and leaves all non-essential bells and whistles behind for the more expensive competition to try and lure you in. 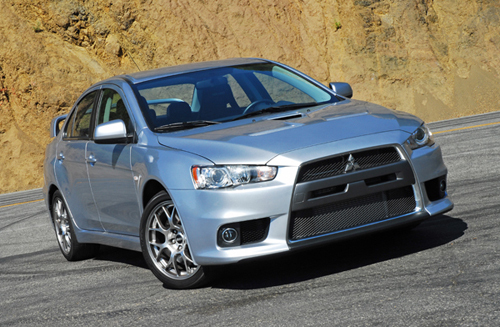 While remaining true to its core elements and values that have made the Lancer Evolution (EVO) MR synonymous with thrilling performance, this next generation limited edition 2008 model offers all-around capability and user friendly technology that distinguish it among the world’s best performance models. The new MR is the fastest and highest performing sedan for under $40,000.00 on the market. The MR showcases new performance and handling technology, including an all-new 2.0 liter turbocharged and intercooled engine and the Super-All Wheel Control (S-AWC) dynamic handling system. The new 6-speed Twin-Clutch Sportronic Shift Transmission (TC-SST) is a computer controlled sequential-manual transmission with magnesium steering wheel shifter paddles and console mounted ball-topped shifter that works seamlessly with the S-AWC to regulate drive torque at each wheel by controlling a network of dynamic handling technologies, including Active Enter Differential (ACD) 4-wheel drive, Active Yaw Control (AYC) rear differential, Active Stability Control (ASC), and Sport ABS brakes. A helical gear-type limited-slip front differential is used. What this all means is that torque is transferred to the wheels that will always keep the car accelerating with grip to the pavement enabling the MR to rocket out to 60mph from a standstill in just 5sec., and pull almost 1g when cornering at high speeds. There are three settings ‘tarmac’, ‘gravel’ and ‘snow’. 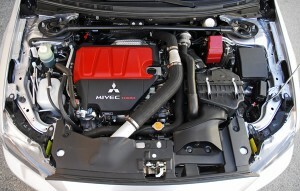 Power is generated by a new MIVEC 2.0 liter intercooled-twin-scroll turbocharger, DOHC inline 4-cylinder engine based on a reinforced cast-aluminum cylinder block with aluminum heads. 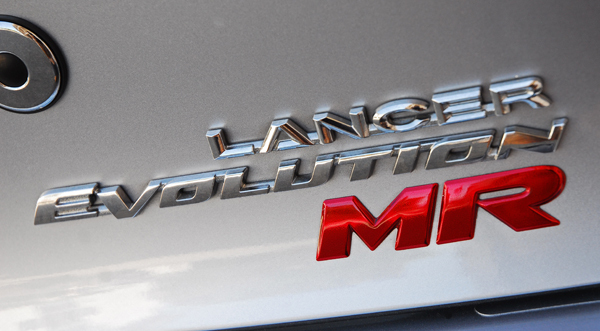 This high-output engine makes 291hp at 6,500rpm, and 300lb.ft. of torque at 4,400rpm. Unlike the 4G63 engine used in the previous model, the new 4B11 engine does not use a balancer shaft, made possible by the new engine’s inherently lower noise and vibration and use of hydraulic engine mounts. The engine revs freely and the rear-located (firewall side) stainless steel exhaust manifold helps improve weight distribution. The exhaust note produced by the dual exhaust system is a low growl and grows louder as you push the throttle harder. The race-bred, unique suspension system features a MacPherson setup in the front with inverted gas-charged struts, and forged aluminum control arms that reduce unsprung weight. 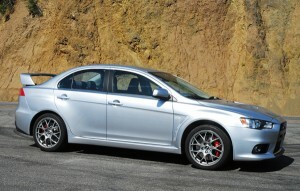 Specifically tuned Eibach springs and Bilstein gas-charged shocks and a 25mm stabilizer bar finish the front suspension. Keeping the front end more rigid and to enhance response is a standard strut tower brace. In the rear is a multi-link setup also with forged aluminum control arms, specifically tuned Eibach springs, Bilstein gas-charged shocks and a 23mm stabilizer bar. 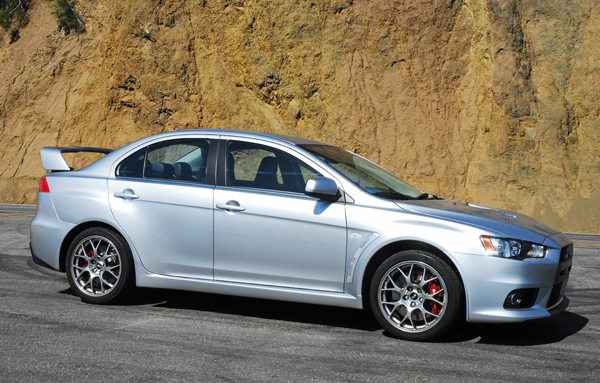 Further enhancing handling and stability prowess is the longer wheelbase and wider track in the new Lancer EVO MR. There is two suspension setting ‘comfort’ and ‘sport’. 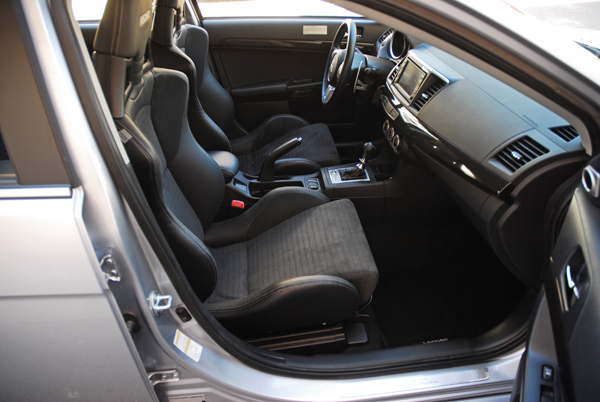 You’ll find the same setup on some of the best handling customized sport compact sedans on the tracks and roads today. This is factory direct without breaking the factory 5-year/60,000 mile warranty and 3-year/36,000 bumper-to-bumper warranty. Keeping you on your chosen path with razor-sharp response is the hydraulic power assisted rack & pinion steering system. 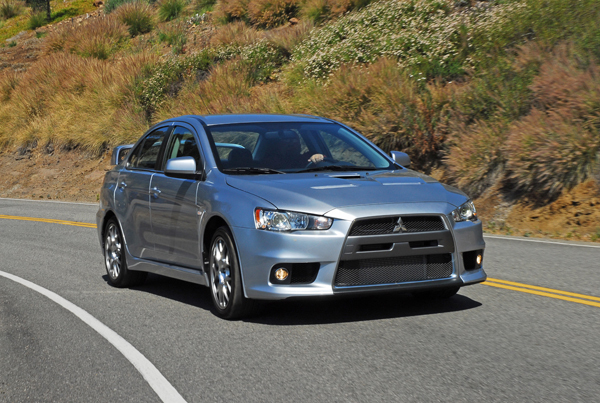 It is fully weighted and gives you a great feel for the road with pin-point accuracy. Just a little turn of the steering wheel and the front end moves with authority. The stability control system keeps you out of trouble but you can shut the system off when you feel the urge to see how far you can go to the edge as you push the high-revving engine faster when cornering. While the suspension is sport-tuned it is never harsh or severe, and I was surprised by how well the ride was when traveling over poorly paved roads in the comfort setting. Further enhancing grip and traction are the standard, 245/40R18in. Yokohama ADVAN asymmetrical performance tires that wrap around standard, lightweight, 18X8.5in. BBS forged-alloy wheels. Now that is a rolling racecar setup. 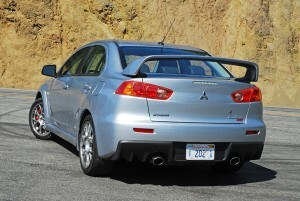 The already stiff MR platform is further reinforced for the 2008 Lancer EVO MR. The roof, hood, front fenders, and both the front and rear bumper beams are made of aluminum for strength with less weight. The battery and windshield washer fluid tank are mounted in the trunk area for better weight distribution to help give the new MR a more nimble feel when maneuvering around slow city traffic, on the straight-away at high-speeds, and when attacking curving mountain roads. Bringing you safely and quickly back to earth is a racecar inspired braking system. Up front are 13.8in. two-piece rotors for weight reduction that are clamped with Brembo 4-piston calipers, while 13in. discs in the rear are clamped with Brembo 2-piston calipers. A 4-sensor, 4-channel Sports calibrated ABS and Electronic Brake Force Distribution system help you control the MR during severe braking maneuvers. Racecar engineering and mechanicals aside, the new MR looks the part of a of a street-wise sports machine with its shark-nosed front end inspired by jet fighter air intakes with a bright grille bezel, HID headlamps, the intercooler easily seen below the lower front air-intake, and fog lamps at the sides of the front bumper with integral spoiler. The distinct wedge-like profile features chrome beltline molding, boxed lower side extensions, and an aggressively sloping hood with integral air scoop and engine heat outlets. The flared fenders feature vertical air-vents up front for a truly unique look. In the rear is a tall lid mounted spoiler, wraparound lamp clusters, a lower air diffuser that helps to better manage rear airflow, two 4in. 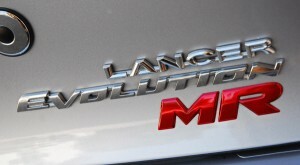 wide oval exhaust outlets that more efficiently expend the hot gases emanating from the high-output engine, and a MR badge for rear drivers to see and not to get to close. Inside the new EVO MR shows a new international flair. 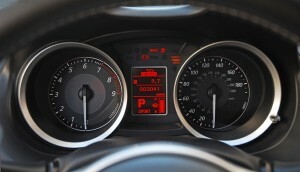 The instrument panel is straight-ahead and easy to see and understand with a 180mph speedometer and 9,000rpm tachometer, the metal pedals add another racecar styling cue, a Driver Information Screen shows all of the important system information easily scrolled through by pushing the Info button. 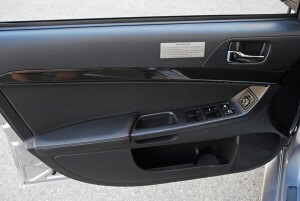 A wide and tasteful black plastic strip runs the length of the dashboard into the door trim to breakup the solid black material. An aluminum strip mounted on top of the center stack that also rings around the two large gauges, and chrome accents at each of the four air-vents, all add up to a more sporty look. The incredible Recaro sport bucket seats are manually operated, very comfortable and firmly keep you in place during spirited driving times with suede inserts. The 3-spoke, leather wrapped/tilting steering wheel feels perfect in your hands and contains buttons for the audio system, Bluetooth communications, and cruise-control. Contrasting white stitching is found at all the seams of the black leather seats, steering wheel, shifter and armrests. While not ‘bare-bones’ the interior doesn’t feature plush, power adjustable/heated seats, real aluminum trim, dual electronic climate control or a self-dimming rearview mirror like most of the more expensive competition. You do get a standard 140-watt AM-FM-CD audio system with digital signal processing, MP3 playback capability and six speakers, an easy-to-use single automatic climate control system with air filter, rearview mirror with flip-up dimmer, a center floor console box with armrest and dual cup-holders, dual visor vanity mirrors, 12-volt power plug, door pocket storage, large glove box, color-keyed outer door handles and power-remote folding/side view mirrors, grab handles above each door, power windows/door locks with driver-side express up/down, floor mats, fog lamps, dual map lamps, leather-wrapped steering wheel with buttons for the audio system, cruise-control and Bluetooth communication system, rear seat heater floor ducts, pull-down rear seat armrest with dual cup-holders, remote keyless entry, and side marker lamps. 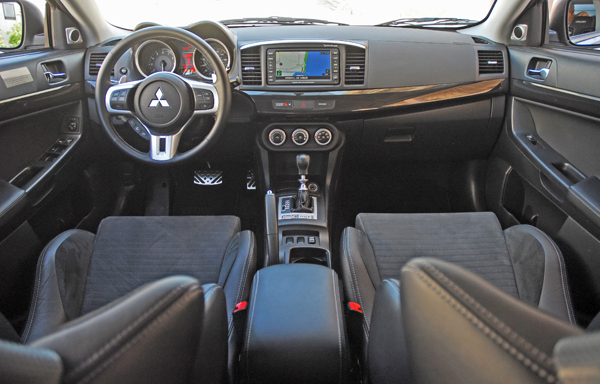 The MR Technology package adds a Rockford-Fosgate 600-watt system with 9-speakers and a trunk-mounted subwoofer and SIRIUS satellite radio with six-month service, a 30-gigabyte hard disk drive a Mitsubishi navigation system with 7.5in. color touch screen and music server function, a Mitsubishi Multi-Communication system, and the Fast Key entry system. Standard safety systems include advanced dual front airbags, front seat mounted side airbags, 3-point safety belts for all seating positions with front load limiters and pretensioners, side curtain airbags, driver’s knee airbag, RISE body contruction with front/rear crumple zones and steel beams in each door, adjustable front/rear head restraints, child safety locks, tire pressure monitoring system, LATCH system for child seats, daytime running lamps and an engine immobilizer. 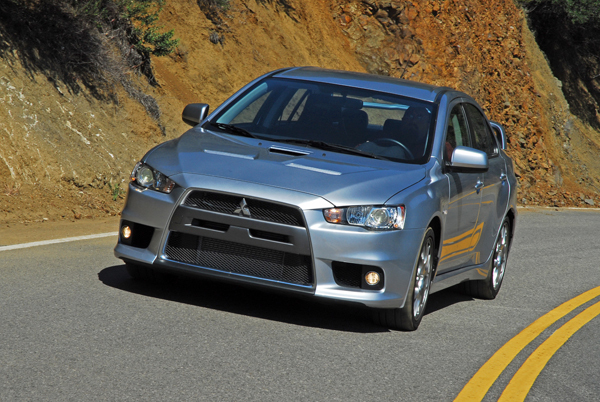 The new Lancer Evolution MR is now a markedly better car for everyday driving. The power is up and the suspension is tuned to provide a more compliant and stable ride than before without compromising its amazing handling performance. I’ve finally gotten my hands around the sport steering wheel of the all-new EVO MR as there are no changes slated for the 2009 model, and I found the EVO MR to be easy, fun and when the moment is right, a thrilling ride with all the necessary interior refinements, safety, and high-tech systems that make this MR a daily driver and weekend track performer. Front Head Room: 40.6 in. 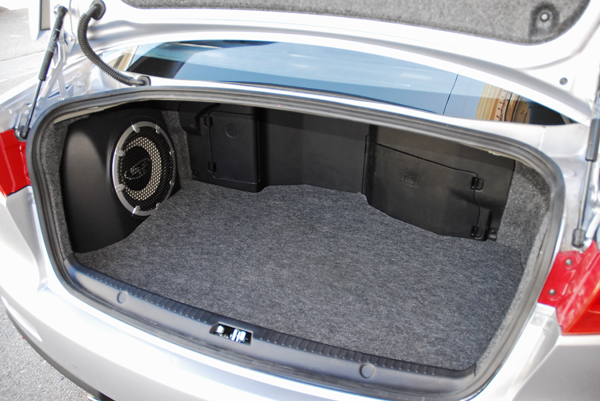 Rear Head Room: 36.9 in. 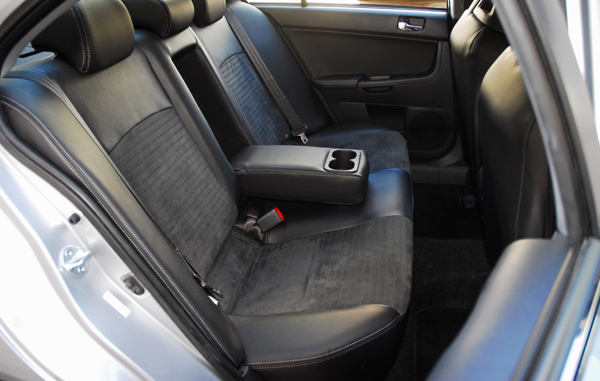 Rear Leg Room: 33.3 in. Luggage Capacity: 6.9 cu. ft.
Automatic: 246.5 mi. / 319 mi. / 275.5 mi.